When thousands ascend to Mizner Park Amphitheater to boost their healthy living-IQ and enhance their lifestyles at WPEC 12’s free and open-to-the-public third Annual Health and Wellness Experience (HWE) on Saturday, March 19th, community sponsor Boca Raton’s Promise (BRP) will be putting Mental Health center stage from 10 a.m. – 4 p.m. With large tent location next to the main stage and across the aisle from the WPEC CBS12 and WTVX CW34 booths, event-goers will engage in inspiring and enlightening life-changing conversations, become educated on support resources and empowered in which ways to cope for youth, young adults, college students, parents and seniors. Programming is presented by BRP and the Palm Beach County Action Alliance for Mental Health, a 28-member coalition. Topics to be explored under the 20’ x 20’ tent include teen and depression, post-partum and other situational stress, parenting and coping skills, eating disorders, substance awareness and mental health for the sandwich generation. Visitors can learn about Mental Health First Aid training and the therapeutic value of engaging in support groups and arts and craft-making. Trained therapy dogs that go regularly into our local hospitals, nursing homes, and courtrooms will be on site with volunteers sharing the mental health benefits provided by therapy dogs. Activities will include children’s emoji cookie decorating and ‘I AM’ tailgate-style games presented by school FRiENDS program. In the HWE’s screenings section on the amphitheater’s clock tower patio, BRP and MHA-PBC will be hosting a ‘depression screening’ tent, youth adult ‘emotion’ art activity and adult coloring sheet sessions in the event’s designated ‘screening’ section. 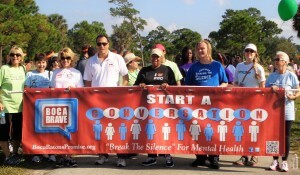 Participating resource organizations include 211, CHADD, National Association For Mental Illness (NAMI-PBC), Healthier Delray Beach, Mental Health Association (MHA-PBC), Boynton Beach Mental Health Initiative, Boys Town South Florida, Christine E. Lynn College of Nursing, Alliance for Eating Disorders, The Sage Institute, Living Skills in the Schools and the Faulk Center for Counseling. Statistics show that one half of all mental illnesses begin by age 14 and 22 percent of middle school students reported considering suicide 2011. It is related to bullying, drop out, absenteeism, violence. It affects all ages, cultures, faiths, schools and workplaces. It’s cost equals 40% of the gross national product. She adds that the social fabric of communities is being impacted by untreated mental illness. “Every nonprofit, every school and every faith community is being challenged. Caregiving of adult children living at home and their burdened siblings is not often discussed. Indeed, mental illness is impacting both families and communities beyond their ability to respond. Free parking for HWE is available at City Hall and the Downtown library with complimentary trolley service to Mizner Park. Parking is limited onsite. For more information and updates on Boca Raton Promise’s activities planned for the WPEC12 Health & Wellness Experience, visit www.bocaratonspromise.org, LIKE its Facebook page or call 561-866-1850.